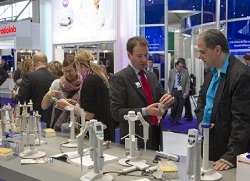 ANALYTICA 2012, the 23rd trade fair for the laboratory sector, closed today in Munich, Germany, having attracted 30,000 visitors. While the organiser is determined to put a positive spin on the figures, this represents a 10% drop from the last show in 2010, when 33,000 attended, and 2008 when the event attracted 32,500. The number of exhibitors dropped only slightly, from 1038 to 1026, which has to be considered something of a triumph given the peculiar circumstances of this year. Globally, the economic misery that began about five years ago is still hampering real growth in most industrial sectors – and that is as true of the market for laboratory equipment as any other. Germany remains the economic powerhouse of Europe, but even this national economy is being hamstrung by the ongoing difficulties across the Eurozone. Then we have to consider the strange effect of the exhibition cycle in the laboratory sector. 2012 happens to be one of those years when the European industry is faced with two major German trade fairs: Analytica (Munich, April), and Achema, held in Frankfurt in June. The unsynchronised nature of these events – Analytica every two years, Achema every three – means that every sixth year they coincide. Inevitably, and especially in times of austerity, budgets for both exhibiting and attending trade fairs may not stretch to both events. Inevitably, both will suffer a little – but because Achema is a more broadly-based event covering chemical and process industries as well as analytical science, it might expect to suffer less. We’ll only really know the truth about that in late June. For comparison, the equivalent US event is Pittcon, held annually in February. This year Pittcon attracted about 15,800 people, including both those attending the conference and personnel from the 950 exhibiting companies. One area where Analytica 2012 did make significant progress was in its conference programme, where attendance rose 40% to over 1700. According to Dr Martin Vogel of the German Chemical Society, the conference organisers are very satisfied with this outcome. “Attendance at this year’s lectures was so good that it was standing room only in many of the rooms. The topics were well received among participants and speakers from Germany and abroad. For them, the conference is an important, established analysis platform in Europe”. 120 speakers discussed the latest trends and topics in analysis methodology and applications in 22 symposia. Overall, Analytica 2012 put in a solid, if not spectacular, performance in a difficult year. The organisers must be looking forward to better market conditions, and less local competition, for Analytica 2014. Thanks for posting this article with a fair evaluation of the figures. We hope to welcome you to the show in 2014!